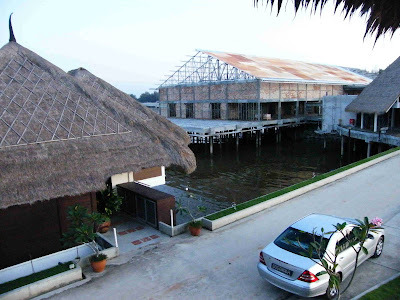 We did not reach Sepang Gold Coast by sunset as intended, as our car was somehow infested with ants in Singapore and we had to stop by to get rid of those pesky creatures. I think a nest must have dropped off from the tree the car was parked under. I take it that the car must have been cozy for living creatures. 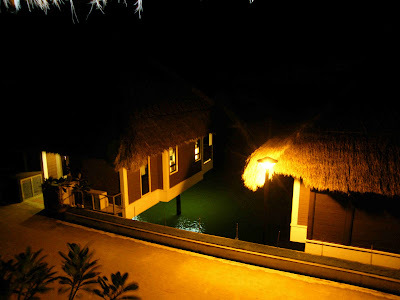 It was already dark when we reached the resort. 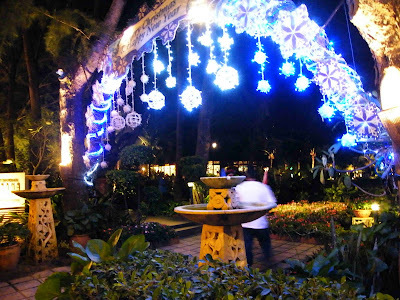 This time we were greeted by the illuminated Christmas archway. 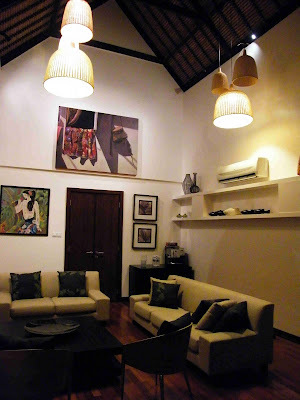 This is the sea villa that the girls stayed in for the evening. I took the one-room villa opposite. This is a single room villa. I love the steep pitched attap roof. It reminded me of my grandmother's house in the old days in Singapore - back then when we still had kampungs. 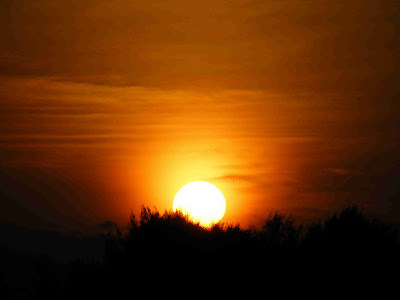 We stayed up chatting for a while, but I went to bed earlier to catch sunrise in the morning. 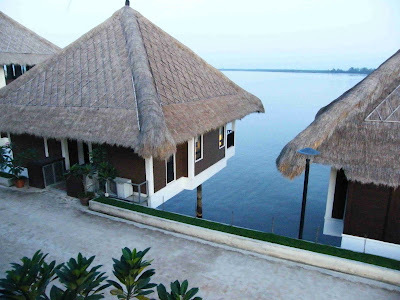 Where the villas are, it is possible to watch sunrise in the morning at one side and sunset in the evening from the other. 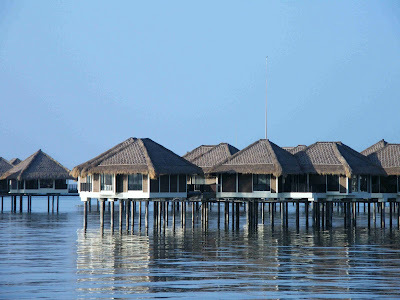 The entire resort, other than the restaurants and offices are built in the sea on stilts. This allows the water underneath to flow without disturbing the ecology. 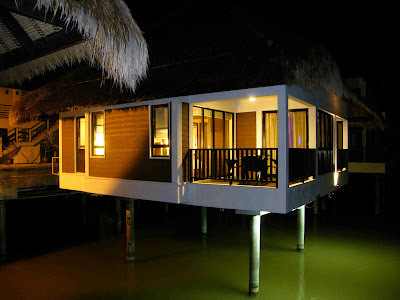 In fact, the villas offer a good shelter for marine life, such that local fishermen have said that there are more fishes along the coast since the resort was constructed. Oysters also grow on the stumps underneath the villas. The chairman and owner of the resort has planned it all along that the construction do not disrupt the ecology of the surroundings. "We must have the resort in harmony with nature. That way nature will help us, because man is also part of nature," he said. This philosophy goes well with Tao, that man exists in balance with nature in respect to the Natural Laws, and all in nature circulates and transforms in harmony. This half completed building in the background will be a multi-purpose hall, which the girls are planning to organise an International Latin and Ballroom Dance Competition in August 2010. I suggested that they make Sepang Gold Coast the Blackpool of Asia (Blackpool has hosted such international dance competitions for 80 years!). This is the villa balcony. In the distance, are other huts. They look like this close-up.
. 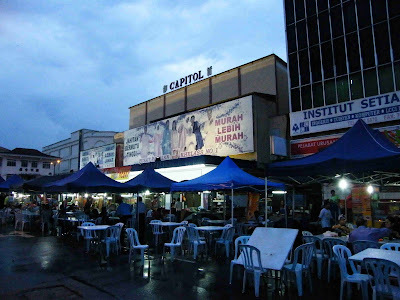 This is the dining area, but we did not have time to have breakfast here, as we have meetings at Shah Alam at 12noon. 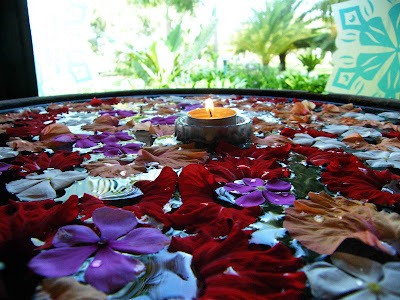 A flower dish in the showroom. Isn't it lovely? 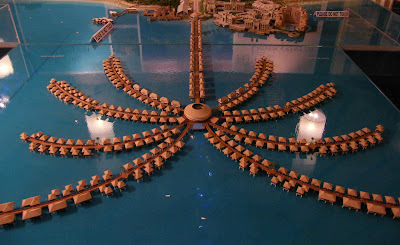 This is the model plan of the resort - a palm tree stretching out to the sea. 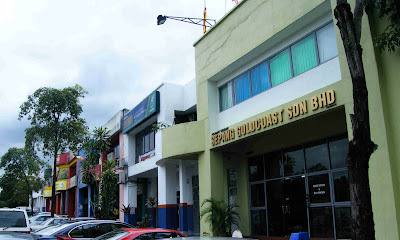 We managed to reach Sepang Gold Coast's Shah Alam's office at 12noon, in time for a lunch treat! By then we were hungry, having skipped breakfast so that we had more time to find our way around. 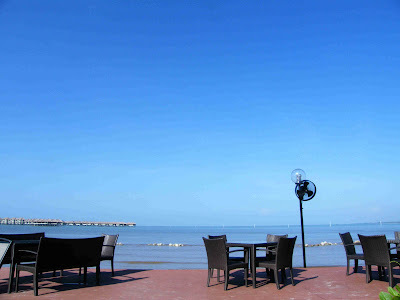 After Shah Alam and our meetings done, we headed for Malacca, with yours truly as the driver. 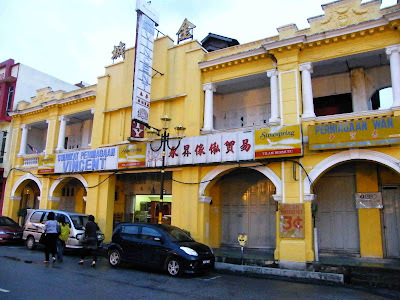 However, the idea of a Peranakan dinner at Malacca soon petered out as it got dark and we felt that it will be too much of a detour. It was prudent that we get back to Singapore not too late as one of us had a morning flight the next day to Macau to judge a dance competition! Otherwise, a sumptous Peranakan dinner at Malacca would have been nice. We opted instead for a Teochew porridge dinner along our route at Seremban. 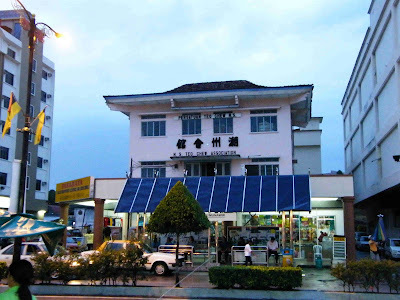 The Teochew porridge restaurant was said to be near the town's Teochew Association, so our mission was to find the association building. We were told that the association's building is behind this old Portuguese-Peranakan styled building of antiquarian charm. This is the town's cinema - still a single screen theatre (as opposed to a multi-theatre cineplex). The last single screen theatre in Singapore, incidentally also called 'Capitol', closed down many years ago! Finally, we found the Seremban Teochew Association!!! Hurray! But no restaurant, as it opens only during the day! So no dinner! Oh dear, we should have gone to Malacca! 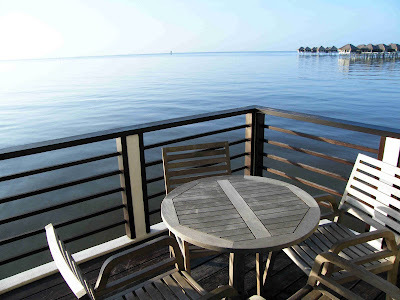 For our previous trip to Sepang Gold Coast, click here.